The 1968 Sweetheart Majorettes will reunite during Saturday’s University of Kentucky football game. Pictured (front row, l-r) are featured twirler Cherie Hubbard Roeth, Bradford, Ohio; featured twirler Joanne Windish Ingram Harrisburg, Pennsylvania; (back row, l-r) Nancy Carter Walton, Ohio, deceased; Sally Moore Barnhart, Lexington, Kentucky; Dee Hawkins Chavez, Morehead, Kentucky; Nancy Bowles, Kentucky, deceased; Chris Carter Schultz, Louisa, Kentucky; Kathy Norris, Kentucky; Debbie Castle Craft, Louisa, Kentucky; Frankie Bratton Jeffery, Scottsville, Kentucky; Lynda Williams Closson, Stanford, Kentucky; and Shana Turner Snook, Louisa, Kentucky. LEXINGTON, Ky. – During the University of Kentucky versus University of Georgia football game on Saturday, the 1968 Sweethearts will return to celebrate 50 years of the Sweetheart Majorettes with the UK Alumni Band during halftime. 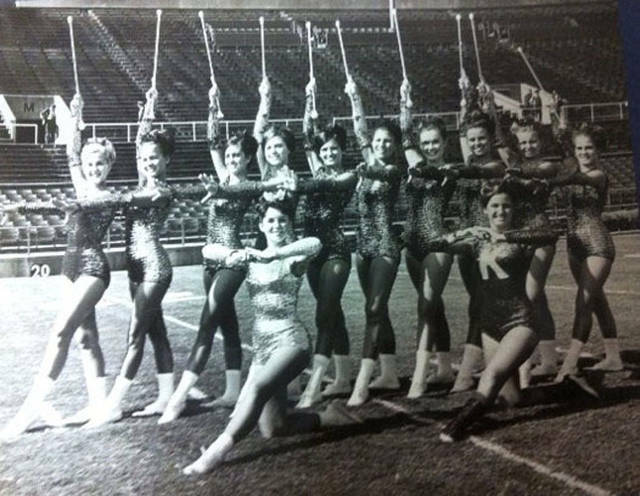 The first line of Sweetheart majorettes made their debut in the fall of 1968 on old Stoll Field during the halftime show of the UK Marching Band. Bradford High School graduate Cherie Hubbard Roeth was selected to be one of the two feature twirlers. The UK Marching Band added female musicians to the band in the fall of 1968 and a line of majorettes called the KY Sweethearts. Twirling is a dying art, and the 1968 Sweethearts are hoping that their publicity campaign celebrating their 50th reunion will bring donations to the newly established scholarship at the UK Philanthropy Department: UK Sweetheart Majorette Scholarship Fund. Majorette scholarship programs have been established at most of the SEC schools.